A measure of the apparent differences in size between the object and the image. A numerical aperture increases, depth of field decreases and resolutions increases. As magnification increases, field of view decreases. As magnification increases, more machine vision light may be needed. Magnification is developed in two ways- different lenses create different magnifications at the machine vision camera, and machine vision camera/ monitor combinations develop magnification between themselves. 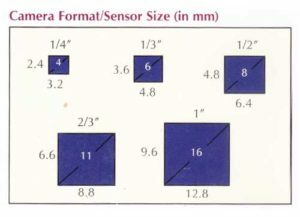 All machine vision cameras have a fixed sensor size. This means that no matter how large the image is at the sensor plane, the machine vision camera will only “ look at” the portion of the subject equal to the sensor size. What the camera “sees” is called the field of view. The lens, or lens system, of the machine vision camera controls the magnification at the machine vision camera sensor. Thelower this magnification, the larger the field of view. When the machine vision camera image is displayed on a monitor for viewing, there is further magnification. The diagonal of the machine vision camera sensor is expanded to the diagonal pf the monitor. Consider this example: A ½” machine vision camera is being used with a 13” monitor. The 8mm diagonal of the machine vision camera will expand to 13” (330.2mm) for a magnification of 41.3X. In practice, the machine vision camera is actually overextended in order to overfill the monitor and prevent dark edges. 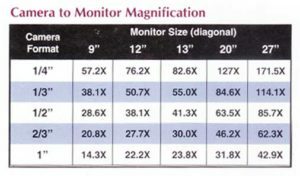 There is no recognized industry standard, however, a 5-10% increase in magnification resulting in a 5-10% loss in field of view can be assumed.